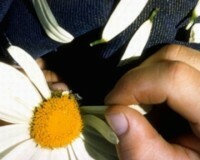 <>, Inspire-O-Gram, "Is God unfair?" You're receiving this free ezine because you signed up for it at www.inspiration-for-singles.com--which proves how clever, sophisticated, and boffo you really are! Welcome to the Easter 2008 edition of Inspire-O-Gram. This Easter many of you are not where you'd like to be. Some of you are far away from home. Some are far away spiritually. And many are far away from where you want to be matrimonially. That's why I decided to take a very different approach in this issue, starting with our main article, "Is God unfair?" Folks said I wasn't much. while leaning on my crutch. a man all bruised and bloody. I thought, "That's no way to die." where the lilies were in bloom. with wax and signet ring. Then soldiers came to guard it. no closer did I dare. Two fellows looked into the tomb. The dead man was not there! and met up with his followers. A group had gathered 'round. as close as I could tell. He came back as he said. I live now and will never die. The single life can be perplexing. Many influences pull on you from all directions. What to do? What to do? 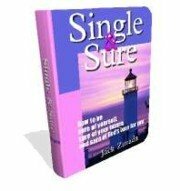 Single & Sure, my ebook, will help you sort things out. You'll understand what's important and what's not, what matters and what won't in 10, 20 or 100 years from now. This is practical, down-to-earth stuff, based on biblical principles and my nearly 40 years' experience in the single life. And all for the price of a couple combo meals in a fast food restaurant! That wraps up our Easter 2008 issue. If you've ever wondered why we don't list an email address in this newsletter or on the site, it's because spammers have nasty little programs that scour the Internet, harvesting email addresses wherever they can find them. Then they start sending the trash we all hate so much. But if you ever want to comment on this newsletter or just send me a greeting, you can use this handy contact form. I hope to see you again next month. Until then, go with God!